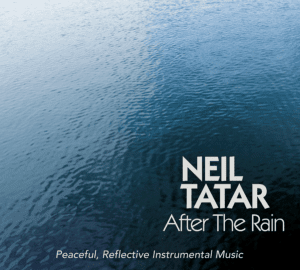 After The Rain is the upcoming release of Neil Tatar. And it comes as advertised on the cover-it is Peaceful, Reflective Instrumental Music. What does a person do After The Rain? I am not sure but I know what I do during the rain, I watch it and appreciate it. It is the sustenance of life. The title of this recording can mean many things. In life situations for instance, After The Rain comes a little sunshine? Whatever your interpretation is it can fit to this music. After The Rain features Neil sharing his equal talents on both guitar and piano, and the usual procession of stars in Will Ackerman’s Imaginary Roads Studios. Tony Levin (NS & Electric Bass), Jeff Oster (Flugelhorn), Jill Haley (English Horn) and Tom Eaton (Piano and Keyboards), who also mixes and masters the recordings at the studio, are some of the talented artists that are present to make this recording a work of art. I have had the distinct pleasure of covering all of the solo works of every one of those folks as well. It is a treasured gift and I feel honored to do so. After, before, or during the rain, it is all a natural force of nature, and whether it is the climate or life situations, this music can put everything into perspective for the listener. The 10 tracks that are offered on this recording are as tranquil as the water that appears on the cover of the CD. It immediately sets your mind and soul at ease. Water is from whence we and all living things came. We need to cherish it, respect it and protect it. Perhaps it is no coincidence that Neil Tatar is a longtime student of Tai Chi, for the songs – while varying in style - feel instilled with meaningfulness. Many thoughts came to mind for me while listening to After The Rain. It always feels right for me to share my thoughts on the music I am hearing. It moves me in the most prolific ways, and I know I am listening for a reason. The talent that comes together on this album is incredible, and the end result is an album you will want to hear frequently for the many values it holds and the lessons it can teach you. All you have to do is listen, then the heart and mind will follow in step to make it all come together. At least that is how it works for me and I hope it does the same for you. This is fantastic music, it is like the masterpiece painting that you have been looking for. One listen of After The Rain will bring that expectation to life.